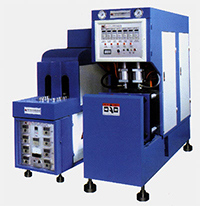 CS-A series stretch blow molding machine is the latest development of a new alternative, a one-box and a box of the second two, simple structure, reliable performance. PET bottle making technologies more perfect, full-series configuration of high pressure air pump (30KG/CM2) low voltage clamping, high pressure blow. Stretching stroke, for blowing-bottle range, rate high.